The second setting was Amsterdam. 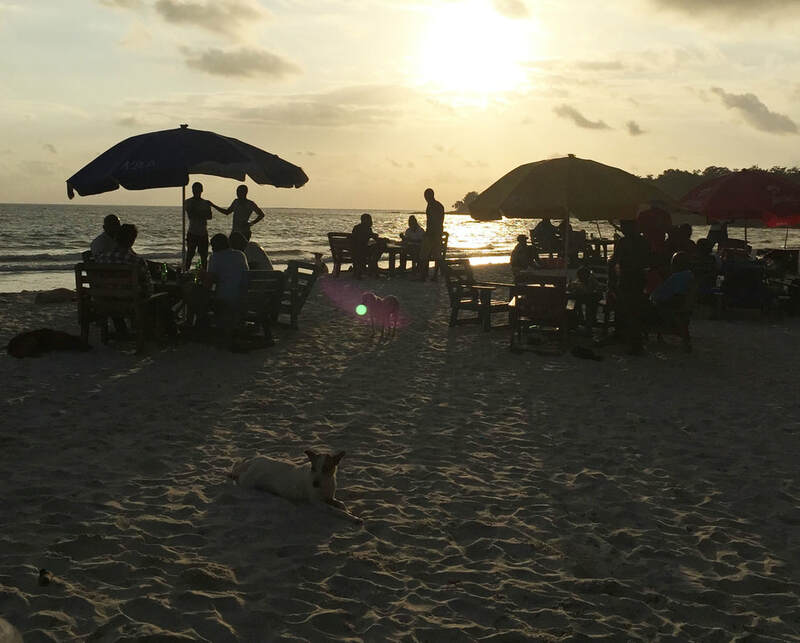 In my father's family history, this city played an essential role. It was from here that the first of my named ancestors (two brothers and one sister) made their way to Pennsylvania in the 1720s. They were from a poor peasant family in Germany, and to escape from a war-torn principality and from religious persecution, these Mennonite refugees had to find a way to pay for the ship fare to America. A large Mennonite church in Amsterdam helped them and many others. 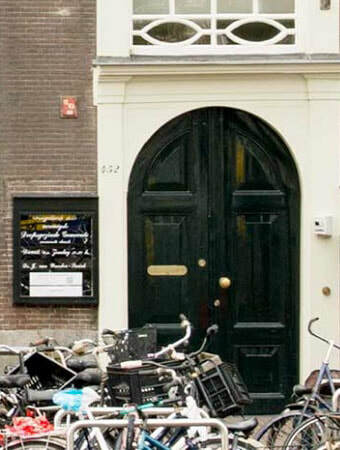 Almost by chance, I located this "Hidden Church" in Amsterdam. This is that story. 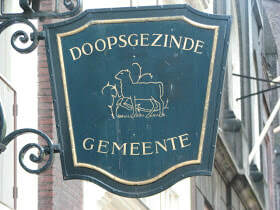 The sign on the building announces "Mennonite Community" in Dutch. This church was known as the "Hidden Church" at the sign of the lamb. The door was made to be plain, and not to stand out from any other door or be recognizable as a church. It was a large facility with a very plain sanctuary: dark wooden floors and pulpit, large balcony with painted posts and railings. Chandeliers—the only decorative pieces. The center of the sanctuary has folding chairs. In the old days they were stacked in the foyer before the service began. Each female churchgoer took a chair after paying a five-cent piece and carried it somewhere into the middle area. The surrounding benches were intended for the men. The children from the orphanage that the church operated and paupers sat in the gallery. In the earliest days, from 1530, during the times of persecution, Mennonites met in private homes. At the beginning of the 17th century, when the Protestants began to tolerate the Mennonites to a certain degree, they began to meet more often in central gathering places. Still, they did not publicize to a great degree the locations of these places. The Mennonites were allowed to have a meeting place but they could not be visible from the street, could have no clock tower, and no church name. The city fathers managed the churches like they managed the rest of the city: tolerate most, but know where they are so you can keep an eye on them. In 1607, the first building was built on this site. This meeting place was called “Near the Lamb.” It referred to a lamb on the gable of the nearby brewery. 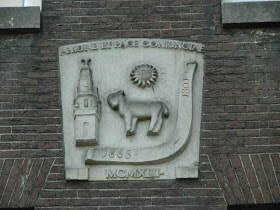 The lamb is still the church’s logo. ​In 1639, a larger structure was built on and in 1839, the roof took its present shape. Over the years, the complex continued to grow. It was used for meetings, a library, and Bible classes. This is a large facility. It is the headquarters of the General Mennonite Society and the Mennonite Centre for Congregational Building. 19th centuries through many endowments and has grown into a collection of books by and about Mennonites unequalled in the world. There is another library used by the Mennonite Seminary (which uses space in this church also). This library contains literature in the field of church history, doctrine, biblical studies, and ethics. The pastor is not called “pastor”. He is called a “teacher” (leeraren)—which is what his role is in the church body. The pastor is just one person in the congregation—he is not “higher” than anyone else. Actually the congregation is the ruling body. The pastor gets one hour a week. At the beginning of the worship service, the president of the congregation shakes his hand and introduces him. At the end of the hour, the president comes up, shakes his hand and sends him back to his seat. 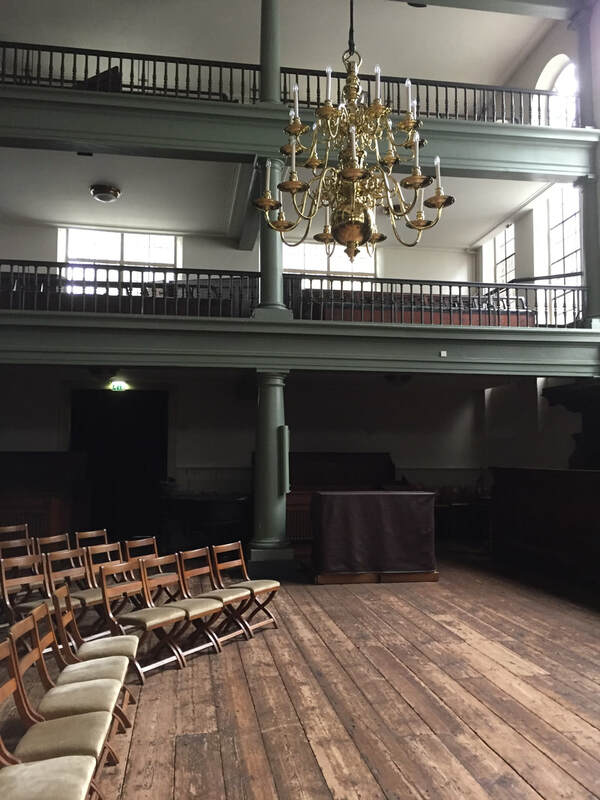 During Reformation time, this was the biggest church in Amsterdam. Today, it has one of the smallest congregations. 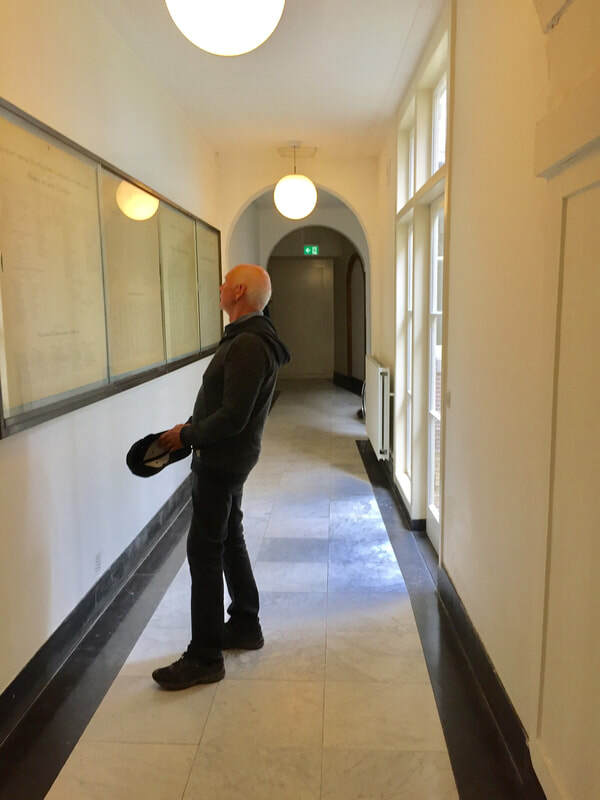 There is a large display on the long entrance wall of a schematic description that portrayed the history of this Amsterdam Anabaptist congregation. Refugees from across Europe had come together in this church. There were Flemish, Frisian, German, and other European groups. The names of all the deacons and preachers (“teachers”) of the congregation from the very beginning up to present are there.